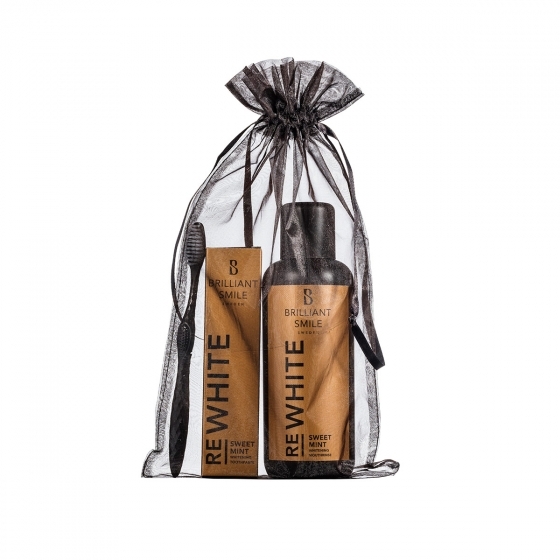 REWHITE is an oral care line developed specifically to remove stains from coffee, tea, tobacco & red wine. The line consists of a mouthrinse and a toothpaste - both with a refreshing taste of sweet mint. The mouthrinse dissolves surface stains and coatings, making them easier to brush off with the REWHITE toothpaste. Use 10 ml and rinse for 1 minute, twice daily. The toothpaste whitens the teeth by cleaning thouroghly and dissolving stains. Use twice daily to revive and maintain a white and healthy smile. Other info: Contains sodium fluoride., Not recommended for children under 6 years old.